Santa Fe, New Mexico the USA’s oldest state capital also boasts the oldest church, house and continuously occupied building. All were built in the 1600s. 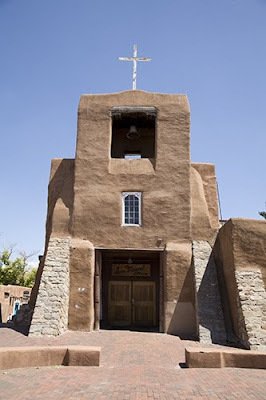 Located on the Old Santa Fe Trail the San Miguel Mission or Chapel still holds mass every Sunday. Indians from Mexico built the original structure, which has been modified over the centuries. Across the road at 215 East De Vargas Street the oldest house is a classic adobe and brick structure. It is said to have paranormal activity. 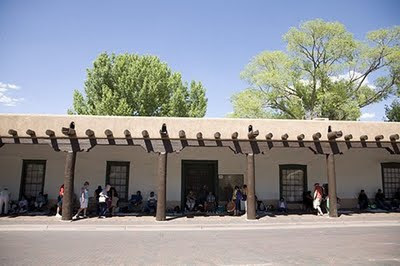 The oldest continuously occupied public building, the Palace of the Governors is located on Santa Fe’s main Plaza. 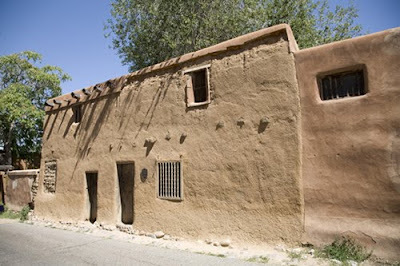 It dates from the early 1600s and was originally the seat of government for the Spanish colony Nuevo Mexico. Today it serves as a history museum. On most days Native American’s from nearby pueblos sell handicrafts and jewelery under its awning. All are located in the historic center within easy walking distance of each other. Those used to living at sea level note that Santa Fe rises to 7,000 feet so it may take a day or two to adjust. Drink plenty of water. The altitude and relatively sparse population (approximately 60,000+ residents) keep the skies a brilliant pollution free blue. Oh, I love old buildings. So much history there. You can't help but look at the Church and see the original structure. The Indian touch sure has lived on. I've always loved this style of architecture. My grandma had this amazing woven blanket hung on her wall for ages and it had this spanish style housing overlooking hills and ocean. This post definitely reminded me that i need to check these out! Thanks! I never knew Santa Fe was the oldest state capitol, no wonder it's always fascinated me. I just passed up a trip to the Alberquerque balloon fest because I'm still holding out for Santa Fe. When I was in New Mexico I never made it to Santa Fe, but I did hang out in Toas for a while and the buildings were very similar! So beautiful. I love the southwest. 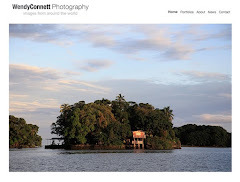 really enjoy yor writing and travels !! Kristine, Having seen pictures of Mali I could see why you might think that. It's been on my list for ages. Kaotic, I love old buildings as well. Corbin, The textiles are gorgeous. Fly Girl, Change your mind please. Santa Fe is about an hour from ABQ and the drive is gorgeous. Gold, Thank you. Would love to see your photography. gorgeous photos!! i love the architecture there. thanks for sharing!